We have quite the menagerie living in our house right now (early 2017 as of this writing). In addition to four humans, we have a dog (Odin), a cat (Cuddleglum), thee rabbits (Hazel, Acorn, and, and Olive), and a hedgehog (Thistle). Well, one of the rabbits (Hazel) is a part-time resident, as he actually lives at my wife’s place of work. But he visits on weekends. 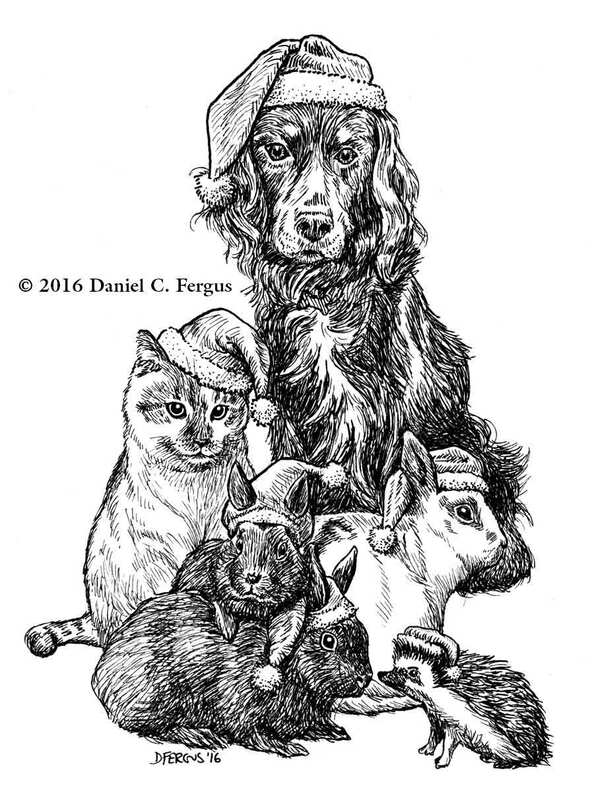 For our 2016 Christmas card, I decided to feature all of our critters instead of my daughters for a change. This was actually Odin’s third appearance, having starred in the 2006 and 2012 cards previously. Cuddleglum also had appeared twice before—in 2005 and 2009.